Excellent and reliable full truckload transportation services can be difficult to find. There may be scores of companies out there that promise outstanding performance and excellent results, but most of these establishments aren’t true to their word. Often, manufacturers and retailers find themselves at the receiving end of poor outcomes, inferior services, and a generally undesirable experience working with these trucking companies. Yet, without any other choice in the matter, these businessmen may have to settle for less and hope for the best. Thankfully, there is another option that’s sure to delight anyone who needs full truckload services. That superior option is Con-way Truckload. Con-way Truckload is a Missouri-headquartered division of Con-way, Inc., which was established in the year 1929 by its founder, Leland James. Then known as Consolidated Truck Lines and later as Consolidated Freightways, Con-way, Inc. started out as a little trucking company with Portland, Oregon as its base. Throughout the years, the company expanded to include numerous acquisitions that led to the great success it now enjoys. One such acquisition is Contract Freighters, Inc. or CFI. It was in the year 2007 that the company realized that in order for it to be globally competitive, with the ability to satisfy the need for wide-ranging commercial truckload services, it had to acquire a carrier to supplement its existing capabilities and business. Thus, by paying $750 million, Conway, Inc. set about taking ownership of CFI, which at that time was already a leading full truckload service provider with over 3,000 employed workers, 7,000 trailers, and 2,600 tractors. That business tactic proved to be a smart one that benefited both Con-way and CFI. The combined forces of both Con-way Truckload and CFI rocked the world of transport and trucking. Between the two of them, they already had extensive experience in long-haul truckload transportation, wide-reaching networks across North America, and considerable operations in Mexico. Thus, it comes as no surprise that the acquisition led the company to earn truckload freight annual revenues amounting to more than $500 million. Con-way Truckload is all you’ll ever need to fulfill your demand for dry van, full truckload, and point-to-point transportation services. The company has an extensive fleet of long-haul trailers and tractors driven by the most reliable solo drivers or two-person driver teams you can imagine. It has five truckload terminals, 37 sales offices, 400 Con-way operating sites as well as more than 3,000 employees on the company’s payroll. With all these, Con-way Truckload surely has the capabilities to deliver the results you need. So what’s the secret behind the excellence that seems to define the company? Well, there’s no exact answer, but you can probably credit much of its success to the company’s core values of safety, integrity, commitment, and excellence. When all these values are reflected in every dealing and transaction, everything just follows – great results, competent employees, and satisfied customers. 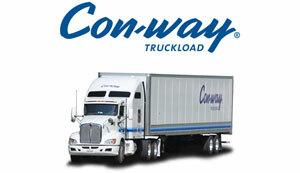 Clearly, Con-way Truckload is doing something, if not everything, right. Con-way Truckload has come a long way since it was founded and is sure to continue growing and improving in the years to come. With such an unparalleled trucking company ready to serve you, it won’t be necessary to look to other companies for your full truckload transportation needs.